Ski season is upon us, and along with that comes a large increase in the incidence of knee injuries we see here at Synergy Healthcare. We discuss why that is so and what can be done to prevent these nasty injuries. It is peak snow season here in Australia and that means there are a lot of people dusting off the ski’s or snowboards and hitting the slopes. 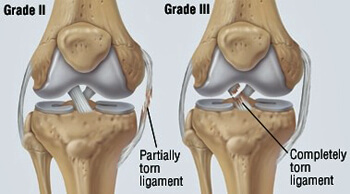 The most common injuries sustained by skier’s and snowboarders are sprains (grade 1-3) to the major knee ligaments; the ACL, MCL, PCL and LCL, this is due to the fact that whether you are skiing or snowboarding your ankles and feet are locked into the board or ski’s and hips obviously connected to our trunk. Therefore if any massive rotation occurs between our bodies and our feet it is generally the knee joint that is the weakest link in the chain, and as it is not really designed for rotation we usually see some pretty nasty ligamentous injuries usually to the MCL ligament which has been reported as accounting for 15 to 20% of all skiing injuries and 60% of knee injuries in skiers. As some of us are at more risk of injury than others a pre screening of knee stability and strength from your Chiro or Physio is paramount to ensuring that you are ready for the slopes and remain uninjured for the duration of your winter getaway. Contact us at Synergy Healthcare on 02 9522 2125 and see how we can help keep you out of trouble.